“Wembley to Soweto to Brazil” is exhibiting in London again. The project run in 2014 during the FIFA World Cup and has been exhibited at The Hospital Club before. I am proud to see my photographs at the Brazilian Embassy together with the photographs of our brilliant students from Sao Paulo´s favela, whose I helped mentoring. The exhibition is open to the public from 6th May to 13th May, from 10am to 6pm. To see more of my photographs of this project, check my Flickr album here. Get to know more about Wembley to Soweto charity on their website: wembleytosoweto.com. Photos of the opening evening bellow. “Wembley to Soweto to Brazil” está em exposição novamente em Londres. O projeto ocorreu em 2014 durante a Copa do Mundo FIFA e já esteve em exposição no The Hospital Club em Londres. 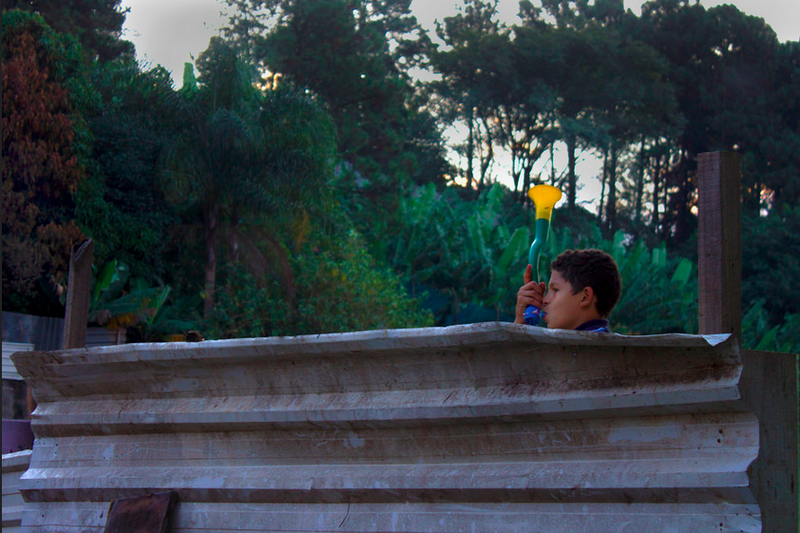 Estou orgulhosa de ver minhas fotografias na Embaixada Brasileira junto com as fotografias dos nossos jovens estudantes e talentosos da comunidade Jardim Colombo em São Paulo, os quais eu ajudei a orientar. A exposição estará aberta ao público entre os dias 6 e 13 de Maio, das 10am as 6pm. Para ver mais de minhas fotos desse projeto, veja meu album no Flickr aqui. Saiba mais sobre o projeto Wembley to Soweto no site deles: wembleytosoweto.com. Fotos da noite de abertura a baixo. Innocent Fun at Favela Jardim Colombo, Sao Paulo, Brasil. Over the years I realised that my courage to the adventures, changed a little its attitude. The maturity made me more conscious and aware of danger, a vision of possible variables that can make things go wrong, and not only wrong, being unsafe. Always noticed that people who never had such an experience and are the optimistic type, are even somewhat naive when facing situations and end up running into something worse than imagined and discover they were not prepared for that. The lack of knowledge about a subject that individual immune to fears and insecurities, perhaps braver and therefore happier, since there is nothing to worry about. From the moment that you have an understanding of the problems around you, either about work, marriage, family or personal, is enough to prevent yourself, thinking and worry about them, beginning to develop ways to solve them. This would already cause some anxiety, but if the individual is not aware of these problems, or are not seeing them clearly, would never give proper attention until it comes to an extreme that reaches directly to then, forcing a reacting to it. I always wonder: will be better to have the knowledge and prepare for it, which involves concern and anxiety, or to keep away from them and they just have an attitude when there is an explosion? Photograph from Brazil 2014 project, on Wembley to Soweto Workshop during Brazil 2014 World Cup. See all photos on my Flickr. Com o passar do anos fui percebendo que a minha coragem para as aventuras, mudou um pouco de postura. A maturidade trouxe uma consciência de perigo mais alerta, uma visão de possíveis variáveis que possam fazer as coisas darem errado, e não só errado, passam a não ser seguro.